Incidentally, not one toddler has told me how much he likes it yet. They’re just jealous of your amazing artistic abilities. The color distribution is very even. 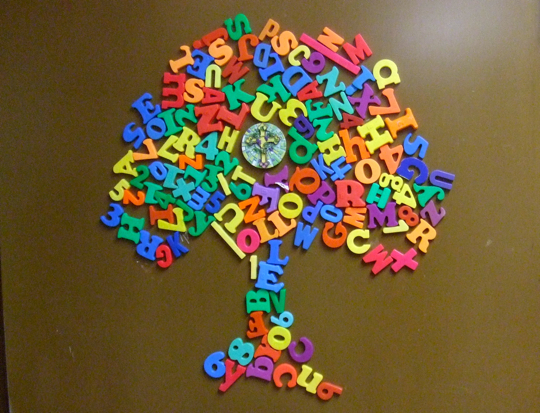 I wonder if there are other artists who work in the medium of magnetic alphabet? If you look closely, he kinda accidentally ‘signed’ it. That is beautiful Lloyd!! Just beautiful! Great job! And I found your name…oh yea. And I found my initials. I wonder what else is in there. I found the words muse, loin, main, and fan. I love this game! What’s that second L for? The extra L is for Letters.